Didn’t mean to disengage from the discussion – the usual end of year fire drill nonsense at work. Indeed - they looked at a card with a dramatic image of a tower being struck by lightning, and called it... saetta, fulmen, fuoco, and foudre. They didn't call it torre, turris, or tour. The name is stronger evidence of the meaning than the iconography, the prop, which is thereby proven incidental…. Lightning strikes towers, just as it strikes trees, it causes fires, it is stunning whatever it hits. But it is the lightning, not what it hits, that is the subject of the card. Divine wrath is how I would describe the action of the lightning and the meaning of the card, not as tower, which is incidental yet commonplace in demonstrating the wrath aspect of the lightning bolt. But I do find it significant that the tower exemplar of wrath resonated so well with the card-playing public that is the name that ultimately stuck with this card and is known as today. Why? This form of wrath, lightning on a city/tower, was the perfect mnemonic device due to the many classical and biblical exempla which all indicated the same thing: Filelfo referred to the Gigantomachy in his use of sagitta for Jupiter’s wrathful lightning bolts, Nimrod struck by fiery lightning for having built the tower of Babylon in the Sola Busca (yes I know that deck is not tarot per se, but contemporary and relevant in terms of the exemplary theme in the medium of cards), while Masaccio used a similar theme for God’s expulsion from Paradise (damning rays emitted from the tower as well as the archangel with sword), and the SHS has the destruction of Lot. Even Hurst in his long-winded explication of his own ideas implies wrath: “The obscure Fire/Tower card is paired with, and triumphs over, the Devil” (in the 'Dummett and Iconography/Methodology' thread). Unlike the card from the Tarot of Charles VI, more consistent with Marseille's pattern, Viéville's allegory features a man below a tree, seeking shelter from a pouring rain that some clouds deliver after having covered the sun. Some of the "drops" are red and yellow, and likely refer to thunderbolts, whereas the clouds darkening the sun represent more symbolically God's rage. I was wondering where your signature quote came from - and I suppose all the more reason we shall continue to disagree (agreeably I hope) on this card for now. I do owe you my literary source post that will explain why I have in turn dug in my heels on the interpretation on this card. Soon…. I want to go back to these thoughts from both of you, which are in quite an interesting direction. "Every good gift (2) and every perfect gift is from above, and cometh down from the Father of Lights." Further also, every procession of illuminating light, proceeding from the Father, whilst visiting us as a gift of goodness, restores us again gradually as an unifying power, and turns us to the oneness of our conducting Father, and to a deifying simplicity. For (3) all things are from Him, and to Him, as said the Sacred Word. Ps.-Dionysius's version of Romans xi. 36 is not like anyone else's. His is a Neoplatonist reworking of his text, unless the one we know is a de-Platonization of some previously existing line of a Platonist hymn. The Vulgate has "quoniam ex ipso et per ipsum et in ipso omnia ipsi gloria in saecula amen" (http://www.biblegateway.com/passage/?se ... on=VULGATE). To us death is not, as others imagine, a complete dissolution of being. It is rather the separation of two parts which had been linked together. It brings the soul into what for us is an invisible realm where it, in the loss of the body, becomes formless. and nothing about "formless". I do not know the original Greek, or Traversari's translation. It seems significant that the tohu/bohu is what is in the illustration, implying the beginning. If the last six to eight trumps (depending on how far the metaphor is taken) are about an allegorical ascent to God, then, on a cosmographic interpretation (I am talking about a rationalization of the sequence, not what is in them naturally or conventionally, which I think isn't much), some people might, in reflection, have seen the first six to ten trumps (counting the Matto as one of them) as a descent from God (Matto as tohu/bohu), a coming to earth of spirit, either God's or the soul's, and receiving God's Wisdom bodily so as to act upon it in the world and then ascend. What ps.-Dionysius says at first is that the light proceeds downward from the Father, and "turns us" toward Him. Such a downward motion of the Light fits my interpretation of the Fool as the Father, the Bagat as the Logos, and the Popess as the Holy Spirit, or perhaps Wisdom, this last, with either name, being closest to us now. But the quote/misquote from St. Paul, seems to go further, because "all things" coming from God include souls. And so the Empress as mother, physical but with the aspect of divine bestower of Life, the Emperor as father, similar but perhaps with Goodness, and the Pope as viceroy of the Word. Then the descent of divine Love, of Reason (the Phaedran charioteer), working through divine-allegorical and human justice, fortitude, fortune, temperance, and time (in whatever order). Or something like that. I may not have gotten it just right. This descent which prepares for ascent is, to be sure, harder to see than the ascent that follows. But I have not studied ps.-Dionysius as much as they would have in the 15th century, or in the context of other Christian Neoplatonist writings they would have read. I am not in a position to see him in the eyes of 1436 Florence, when Traversari finished his translation. But according to the footnotes in the 20th century translation (mostly not online), Divine Names is about God's descent, the "affirmative way" in contrast to the "negative way" of the ascent. Looking there, I see discussion of Wisdom, Life, Goodness, Love, and Soul (ch. 4, 6, 7) descending from God, and justice, temperance (IV, 717A), and reason (725B-C) as from God to aid humanity's struggle against evil (non-being) and toward God (being); Time is another of God's names (IX, 937A, with "Ancient of Days") and the cause of time (940A). (These are also in the online version, http://www.tertullian.org/fathers/areop ... _names.htm. See also Divine Justice.) That is not far from the tarot. Fortitude is an easy addition (mentioned in Ch. 8 sect. 8 and Ecclesiastical Hierarchy 401C). I don't see Fortune mentioned, only Providence (1109C and elsewhere). As in Boethius, probably Fortune is an illusion. Perhaps that is why her personification gets removed from the card, leaving only the more ambiguous Wheel (turned by Providence?). That is as far as I can get. I do not see Betrayal. Death is mentioned only briefly, as quoted above. There is also a negative version of the Bagatto, the magician Elymas of Acts 13 (Ch. 8, sect. 6), against whom Paul's magic is stronger, turning Elymas blind. The sefirotic Tree of the Kabbalah is another version of the cosmograph, with six of the spheres in pairs and an eleventh outside the Tree (some cosmographs had eleven or twelve spheres). But as Pico says in the Oration (http://vserver1.cscs.lsa.umich.edu/~crs ... Mirandola/), reading Cabala one finds the same thing there as in Paul, Dionysius, Jerome, and Augustine. Again, it is a matter of descent and ascent. Pico's assignment of planets to sefirot is at 900 Theses 11>48, with three levels above them; the descent of the soul through the sefirot is at 11>66. On the left, Sun and Moon are above four stars, the earth at the bottom, and on top is a fifth star, Mercury. In the tarot, that might correspond to Christ at the Judgment. It also resembles in its array of items the Kabbalist tree. But looked at from the perspective of the corresponding metals, gold (= Sun) is more precious than silver (= Moon), followed by the five other metals (= Stars). That corresponds to the tarot arrangement. That version of the hierarchy is shown on the right above. It has an explicit tree. These engravings are late: the left one is from the Vintorum Spagyricum of 1625, the right from the Pandora of 1588. But the hierarchy of metals hadn't changed, and the concepts are medieval if not earlier. Alchemical texts were from the Arabs, who also wrote "ascension" texts. In the Christian 12th century, there were the illuminations I posted at viewtopic.php?f=12&t=172&start=20#p14575, which Ross identified in following posts as being in a ms. of the Visconti Library. I thought Marco suggested that the illuminations were of Muslim origin, but I can't find his post now. The Arabs might have used cosmographs and alchemical diagrams as different ways of expressing similar things. Braid, in his book where he translates the text from the Visconti library, finds many Arab-Christian parallels in the 12th century, when the book was written. As far as the relevance of alchemy, according to Gnaccolini in the catalog to the Brera Sola-Busca exhibition (p. 88, re exhibit 11), one of the two alchemical works they exhibited was illuminated for the Benedictines, perhaps the Camaldolese, in or around Florence in the late 1460s (it has an illumination of Raymond Lull handing a book to a cleric in white). I am still reading about the second alchemical text. Added later. I have found the image on the right, which I identified as 1588, in a ms. of the Heilege Dreifaltigkeit c. 1450-1475: http://www.flickr.com/photos/chemherita ... otostream/. That's the text the revision of which was sponsored by John, Margrave of Brandenburg (d. 1464), father of Barbara of Brandenburg, Marchioness of Mantua (d. 1481). Per Wikipedia the manuscript was done in 1433, which was also the year of Barbara's marriage (http://en.wikipedia.org/wiki/John,_Marg ... g-Kulmbach). In relation to the subject here, a couple of posts of mine on other threads are relevant. 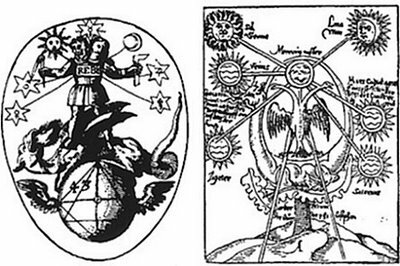 First, on the relevance of the alchemical version of the cosmograph, see viewtopic.php?f=11&t=988#p14772, on the "ladder" and Last Judgment language in 15th century alchemy. There were also illustrations of alchemsits ascending on ladders; they are in books done in the 17th century, but probably based on prior (14th century or earlier) descriptions. We shall find the Mystic Theologians enfolding these things not only around the illustrations of the Heavenly Orders, but also, sometimes, around the supremely Divine Revelations Themselves. At one time, indeed, they extol It under exalted imagery as Sun 39 of Righteousness, as Morning 40 Star rising divinely in the mind, and as Light 41 illuming without veil and for contemplation; and at other times, through things in our midst, as Fire 42, shedding its innocuous light; as Water 43, furnishing a fulness of life, and, to speak symbolically, flowing into a belly, and bubbling forth rivers flowing irresistibly; and at other times, from things most remote, as sweet-smelling ointment 44, as Head Corner-stone 45. But they also clothe It in forms of wild beasts, and attach to It identity with a Lion 46, and Panther 47, and say that it shall be a Leopard 48, and a rushing Bear 46. I think that by "Light illuming without veil" he means the moon, because its face is often occluded. This passage is part of an account of the ascent to the divine in meditation, for which he finds relevant imagery in disparate biblical pages, which he puts together in one sentence and tries, later in the same section and in chapter 15. Unlike in Revelation, the lights are presented in their full brightness, after which the light of the Lamb there would be even more impressive. Pseudo-Dionysius is an author that was getting much special attention at that time. Traversari had just translated it, presumably from a new manuscript copy brought over from Greece, in 1436-37. I quoted Lackner as saying. Between 1436 and 1437 Traversari completed his translations of Ps.-Dionysius's Mystical Theology, Divine Names, Ecclesiastical Hierarchies and Celestial Hierarchies. Ficino consulted this translation, Lackner says. Pico quotes from Ps.-Dionysius, too, I presume from the same source. Knowing this passage is not necessary for playing the game, of course; but it would be instrumental for appreciating the sequence spirtually. Back viewtopic.php?f=12&t=984&p=14652&hilit= ... ici#p14652 I argued for an understanding of the third section of the tarot sequence, from Death to World/Angel (depending on the order), in terms of a depiction of Dante's Divine Comedy in a late 15th century illumination done for a manager of the Medici bank in Geneva. That illumination would not have influenced how tarot imagery was viewed in Florence, but it seemed to me that it might well have reflected a common view in Medician circles at that time. I didn't realize, until I actually went there last October, that this illumination is a somewhat modified copy of a fresco in the Duomo of Florence Cathedral, done in 1465 by Domenico di Michelino. It shows the Moon directly above Adam and Eve, in the first of a series of arcs that ends seven levels higher, in the fixed stars at the top left of the picture. Situated near the entrance to the Duomo--there isn't much else on those bare walls, except one of those equestrians--the cosmograph would have been very much in people's imagination at that time, not only of Florentines but also of the many who came to Florence to see the magnificent Brunelleschi dome, the first dome built higher than that of the Pantheon of ancient Rome, Whoever commissioned the Cary Sheet would have known this fresco or a drawing of it. If so, a natural interpretation would be that the Fire or Arrow card is of a lightning or fire bolt from the same level as the ring of fire at the top of the Mount of Purgatory. Then the Star card represents the nymph at the source of the two streams from which Dante must drink to enter into the Heavenly Paradise, with the stars of that Paradise above him. The next step will be the Moon. It and the Sun stand for all. In all the pictures on the Web of that fresco, it looks like only four stars in the 8th sphere. Perhaps that's all there are. Since there are usually more, or less, on the Star card, I took a picture of that corner to study when I got home, unfortunately with a cheap camera and no a tripod. 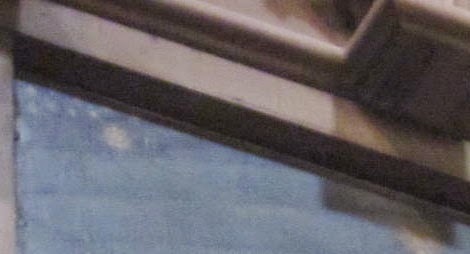 Below is that corner at two settings of the photo processor. The second, with the brightness and contrast turned up, lets one see into the shadow made by the frame; there's nothing there, but it's nice to see that. An interesting feature of this fresco is that the planets are represented as golden circles, i.e. globes. Venus seems even to be depicted in a partial crescent, suggesting phases. But the stars are as close to being points of light as possible. This difference, with the planets visible as circles but not the stars, some even with phases, cannot be seen by the naked eye. I wonder whether some sort of optical device was in use at that time for viewing the heavens, more than we see in the "Charles VI"